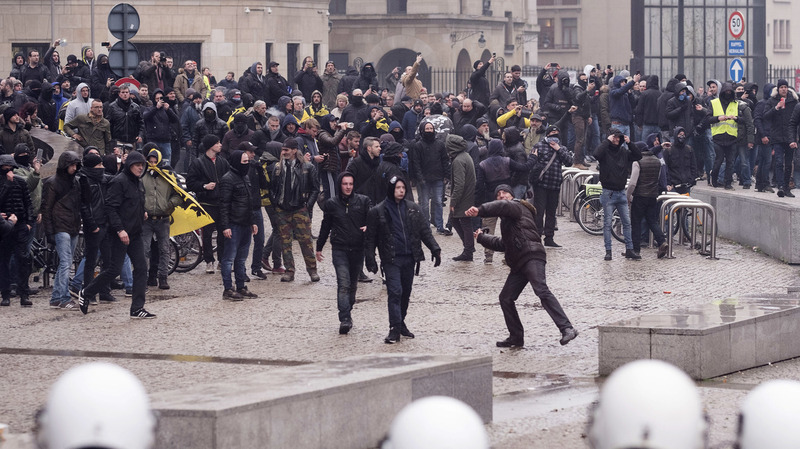 Protesters And Police Clash In Brussels At Rally Against UN Migration Pact Anti-immigration protesters threw firecrackers and stones, and police responded with water cannons and tear gas as the demonstration outside of European Union headquarters turned violent. A protester prepares to throw an object at the police during an anti-migrant demonstration outside of European Union headquarters in Brussels on Sunday. Police arrested nearly a hundred protesters in Brussels on Sunday, after a rally against a United Nations pact to foster cooperation on migration turned violent. Around 5,000 people marched in the streets surrounding the European Union's headquarters, The Associated Press reports. Some carried anti-immigration banners with slogans that included "Our people first" and "We have had enough, close the borders," according to Agence France-Presse. After police asked protesters to disperse, some threw paving stones and firecrackers. In response, police fired tear gas and water cannons at the crowd. Police spokesperson Isle Van de Keere confirmed to NPR that 97 protesters were arrested on Sunday. All have since been released. The protest was initially banned by police, but Belgium's high court overturned the ban citing the right to peacefully protest, according to the AP. Organized by Flemish right-wing parties, the anti-immigration protesters opposed Prime Minister Charles Michel's support for the Global Compact for Safe, Orderly and Regular Migration, which the U.N. adopted last week in Marrakesh, Morocco. Michel signed onto the document, despite opposition from his country's right-wing New Flemish Alliance (N-VA) party. The N-VA pulled out of Belgium's ruling coalition over Michel's decision, leaving the prime minister as the leader of a minority government, according to The Telegraph. The far-right Vlaams Belang party also voted against signing the pact. Bart Claes, president of the youth wing of Vlaams Belang, told the BBC that the government should have asked for public input before agreeing to the compact. "The opinion of the people was never asked," Claes said. "That's strange for something that goes this far." In a separate protest organized by left-wing groups and non-governmental organizations, around 1000 people gathered in Brussels' city center in solidarity with migrants. "We want to raise the alarm to show that the organizers of the other demo are fascists groups," Naomi Stocker told the BBC. "They advertise hate and discrimination and are violent. We want to warn people and send a different message." The text in the non-binding compact offers guidelines to make migration more humane and suggests increased cooperation between nations. Secretary-General of the U.N. António Guterres said one of the goals of the compact was "to strengthen international cooperation against smugglers and human traffickers, and to protect their victims." As NPR's Joanna Kakissis reported, the U.N. document has divided world leaders over immigration. Some European politicians have argued that it could increase immigration and Austria, Hungary, Italy, Poland and Slovakia were among the countries that refused to adopt the agreement. The United States also refused to endorse the pact a year ago, calling it "inconsistent with U.S. law and policy." The agreement comes as the number of international migrants continues to increase worldwide, reaching 258 million last year, according to the United Nations. But migration to Europe has actually slowed since its peak in 2015, dropping by 90 percent according to the European Commission. Still, debate over the pact has illustrated anti-immigrant sentiment in Europe. Marine Le Pen, leader of France's far-right National Rally, said signing the multinational agreement was signing "a pact with the devil." And at a press conference Marcel De Graaf, a far-right member of the European Parliament, incorrectly claimed the pact would criminalize any criticism of migration. Though all 193 U.N. members, except the U.S., had agreed to the pact in July, only 164 signed on at last week's meeting in Marrakesh.